This was what a brother visiting from France said when asked if he speaks English or if he would like to learn it. We all had a laugh at his comment and then started talking to him in English. Since we have no meetings this week because of the Spanish assembly in Benidorn this weekend we were invited to have dinner at the home of Salvador an elder in the Spanish hall. He and his family were taking the lead in the French group before the special pioneers arrived. He is also the one that we were corresponding with when we were still in the US. A sister in our hall named Lolli who is French and Spanish is having her sister and brother in law visiting her for a week from Apt, France. They were also invited to the dinner. We had typical Spanish cusine including jamon, manchego, bread, olives, rice and chicken. We also had Catalonian red wine and cava. The couple from France drove from their home in the Provence region, to Murcia which took them 12 hours. 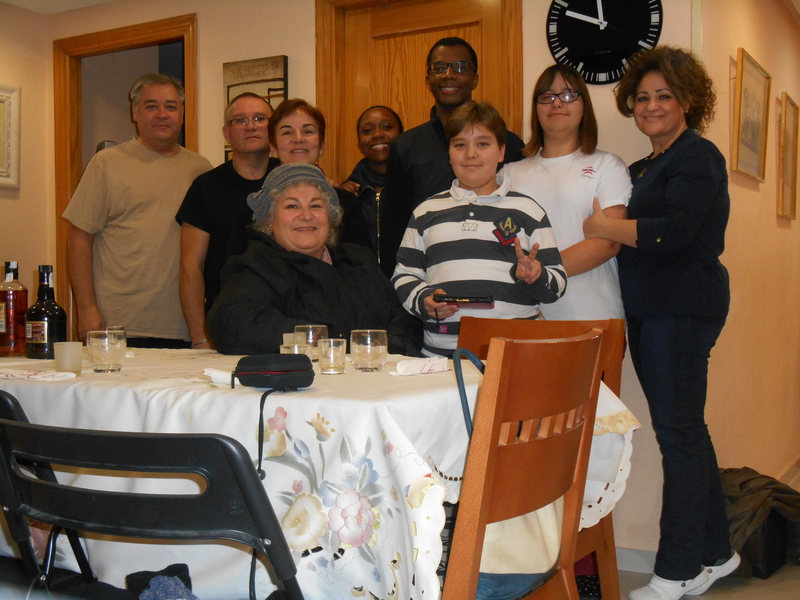 They serve in a Spanish group in France. Many Spanish move to France to work. It was nice to spend time with native French speakers. Jean-Philippe and his wife told us about how the work is progressing in the Spanish field and they may join another group to form a congregation. The day before the dinner the French couple and their sister drove up to Madrid to visit bethel and came back. They really enjoyed the visit and they had great weather in Madrid. It is about a 4 hour drive. The brother was relating to us how an experience of his nephew being baptized and the baptism talk that was given by Jose Gomez. That name might not mean much right now but he explained to us why it was special. For some reason we started talking about gypsies and how they respond to the truth taught in the Bible. In Spain as well as in France there are those who come from a gypsy background who decide to serve Jehovah. The brother was relating to us how difficult it is because the gypsy people have such strong family ties and tradition. If someone decides to do something different they face extreme pressure from those in their clan. It can be very challenging. You might remember an article in the Awake magazine about 10 years ago that told the incredible story of a man who grew up as a gypsy in France. He had a difficult upbringing and had many obstacles. He learned about Jehovah while in prison and after being released he began to make good progress. He eventually got baptized and is serving Jehovah. This brother is Jose Gomez who gave the baptism talk for the nephew of Jean-Philippe. When he heard the talk he didn’t know the brothers story but he said that the following Monday he received the magazine with brother Gomez’s life story and he was blown away. I left out the part that is most incredible about this brother and what he had to overcome because if you have the time it is really encouraging to read for yourself in the 2003 January Awake pgs 18-20. Jean Phillipe got to know brother Gomez more as time went on and he began to appreciate the immense challenge that he had leaving his lifestyle and overcoming his hatred and giving up his vendetta that he had developed. It’s all explained in the Awake. We made it to our new Congregation in Murcia! Amazing study with Jean and Samba! Previous PostHow do I know if its really you? Next PostMy first Bible Study in Spain! How do I know if its really you?